We caught up with former Rockette Trina Simon at Showstopper's Myrtle Beach dance convention to get her expert advice on how to work as a professional dancer. Trina's work on Broadway has given her insight into the key things to focus on as a professional dancer looking for jobs and making a name for yourself, whether you are new to the world of professional dance or you have been making your way from one audition to the next for a while. Above all else, Trina recommends confidence. Being a confident dancer at an audition makes you stand out. Confidence says that you know what you're doing and that you feel like you belong on stage. This will make directors and judges notice you even if you aren't the best dancer because there is something attractive about owning your presence in a room. "MY EYE GOES TO THE DANCERS WITH THE MOST CONFIDENCE. EVEN IF THEY MIGHT NOT END UP BEING THE BEST ONE, THEY PULL YOUR EYE TO THEM BECAUSE THEY APPEAR TO KNOW WHAT THEY'RE DOING." Trina also told us that rejection is something that will happen. Rejection is inevitable when you are an artist, and if you do not think you can handle rejection, this might not be the best path for you. You will learn from these rejections, though, so take your rejections and make the best of them. Trina also recommends using rejection to your benefit by auditioning for experience. Audition for anything you can, even parts that you do not think you are right for or that you might not want. The more you audition, the more comfortable you will feel in auditions. That comfort and experience will help you succeed in your career. "THE MORE YOU PRACTICE, THE BETTER YOU ARE AT IT, AND AUDITIONING IS DEFINITELY AN ART." Working as a professional dancer is a process. Every step of the way is an art that you have to master. Learn every step of this process from the possibility of being cut from an audition to how to pack your dance bag to be prepared. This also means learning and mastering as many skills as possible so you are prepared for whatever an audition may throw at you. This could mean working on your singing skills or taking classes in acrobatics if those are areas that you feel could bolster your presence as a performer. Part of the process is honesty. Don't lie on your resume. Eventually, the skills that you claim to have will be asked of you, and if you cannot meet the director's expectations, you can always be replaced by someone who can. Be yourself and make the most of the talents and skills you do have. That is the best way to take control of your part in the process of working professionally. When you go to auditions or work with choreographers and directors, develop relationships with them! These relationships will help you at future auditions with those same type of creative minds. These connections can also lead you to productions and jobs all over the country and even the world (you don't have to head straight to Broadway!). Trina Simon was a Radio City Rockette for 17 years. She has performed in their Christmas and Spring Spectaculars, among several other events throughout the years. After being promoted to the Rockette's Assistant Choreographer, she trained the Rockettes for 10 years. Trina has also performed in Animal Crackers, A Chorus Line, Crazy for You, West Side Story, The Will Rogers Follies, 42nd Street and Anything Goes at such theaters as Paper Mill Playhouse, Sacramento Music Circus, Casa Manana, St. Louis MUNY, Kansas City Starlight, and Houston's TUTS. Trina is also a former company member of Clear Lake Metropolitan Ballet. 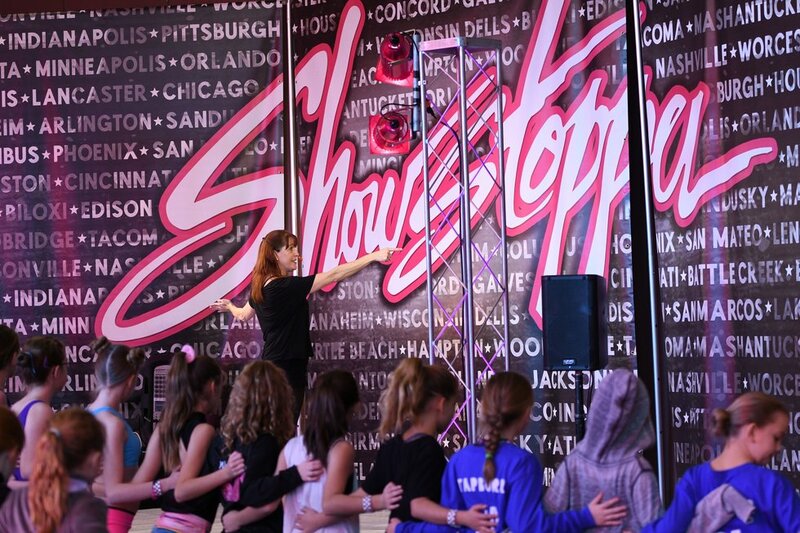 Trina now hosts at Showstopper Dance Competitions and teaches at Showstopper Dance Conventions.